Why are digestive problems on the rise? It is because we are neglecting our internal intestinal environment and so are forsaking our digestive health. Bloating, stomach cramps, diarrhea and gas are just a few symptoms that could be a sign of digestive trouble. In our fast-lived world, we don’t take a lot of time to choose healthy and organic food. Most of us don’t know where the food comes from or what it is made of. We buy our food conveniently in a box. This is where the problems begin with additives, food colorings, trans-fats, preservatives, high fructose corn syrup and artificial sweeteners. This low quality food is offered in every supermarket and is supposed to make our life easier. The standard American diet is over loaded with unhealthy fats, sugar, and chemicals. Conversely it is also low on fiber and nutrition. This highly toxic diet sits in our colon and creates greater strain for the eliminative organs. The way we eat greatly contributes to our intestinal health. There may be additional reasons why our digestive system is lacking e.g. allergies, food intolerance, etc. that could all be checked out by a health care professional. But detoxing can support anything else you are handling. Our intestines are not made to process food that is highly processed. We get constipated and our intestines get blocked and we can’t eliminate and toxins stay in the colon that can cause inflammation and irritation. Beyond that, due to the nature of the intestinal wall, some of the toxins may be reabsorbed back in the bloodstream. This makes your liver and kidneys work harder. Your intestinal flora is made up of bacteria and other microorganisms that exist together. Your body functions best when bacteria are balanced with 80% good bacteria and 20 % bad bacteria. When you introduce too many processed foods your gut flora tends to become imbalanced as the unhelpful bacteria love that kind of environment. About 80% of our immune system is located in the gut, so it’s no surprise that processed food can cause havoc on our overall health. See our simple and healthy recipes. How to kick start your body health with a cleanse? An intestinal cleanse is beneficial in many ways as it gets rid of accumulations, toxins and promotes regularity. Here are some other benefits of an intestinal detox: improves mood, increases energy and concentration, can clear up skin and helps eliminate bad breath, and last, but not least, detoxing jumpstarts weight loss. We have put together a gentle, yet effective 10 day intestinal detox protocol, that will detox your intestines, increase energy, help flatten your stomach and boost your over all well-being. Our specifically designed powerful herbal formulas help you step by step to get rid of toxins and accumulations and are soothing and healing to give you the least discomfort. We use only the high quality ingredients for our formulas to ensure the best results. You can do the cleanse from the comfort of your home in just 10 days, although some people lengthen it to 14 days. Please click here to go to our 10 Day Intestinal Cleanse site for more information. If you think you have parasites, you can choose the Anti-Parasite Concentrate as an add-on at a savings. Once you have cleansed your gut, you can expand the cleanse to include liver and kidneys, and even to our most comprehensive total internal body cleanse. 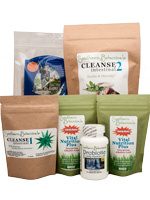 There are many options to adapt the cleanse for your needs. A good start is the 10 Day Intestinal Cleanse and once you get the hang of it expand your cleanse. Life is a lot more fun when you feel better, trust me.